So which way are we going here? While Marty was diverted by events across the Manifold, Raphael was working on upgrades for his constructs, and Conley was catching up on his reading – and trying to adjust to the Manifold – Kevin was sending the two hundred and forty-odd “bandit” prisoners off to Kadia… Most of them were rabbits and panthers of course, but there were a scattering of other species – especially from amongst those caravaners who had “just happened” to be in the area. Pretty much all of them of combatant age too. Most of the kids must be hiding somewhere. He’d have to catch them too! Anthro kids made cute Thrall-pets! In Kadia the prisoners were sent to the after-the-fight carnival party, got the usual introduction-to-Kadia and other briefings (including the escape-briefing on possible places to escape to and their advantages and disadvantages and some subtle conditioning), were set up with a limited monitoring and restraint program, then counselors and social services, then classes and jobs (such as running the carnival rides for Kadia’s 16-hour work week). Since Kadia undid obedience-conditioning slowly, any really determined ones could keep escape on their minds – but it usually took months or years to pull off an escape, even with the regular meetings of the sponsored escape committees to help out. Most never bothered… Kadia had a lot of advantages, and a lot of people settled in and exploited them until they were good and ready to leave… In practice, it was usually much less trouble to simply either serve your time and get set free with a nest egg or to work hard and buy your way out early – but if some clever fellow managed to get away with a heap of treasure or hijack a ship and sail or fly away or something, good for him or her! Kevin figured that was only fair! After all, they had to be prepared for life in the Manifold before they could be allowed to escape! Escape got easier after they did well in classes for awhile! Marty was for that. It looked more serious than the Cat Clan head had seemed to think it was. Raphael didn’t see any real reason that they had to call the guard, but it might be nice to tell them if they felt like getting into more legal knots. Kevin had been thinking more of letting them know that someone had been setting up for a major attack on their city. Being guests there, such a warning seemed sort of obligatory. He sent the city guard a note informing them that the “cat clan exiles” seemed to have had major weapons stockpiles, external backing, and several hundred fighters. He also noted that there was a teleport block up, and so they’d need to arrive a few hundred feet away. He left two of his usual three servants – and a few more disguised thralls – to watch the surface camps while they headed into the caverns. 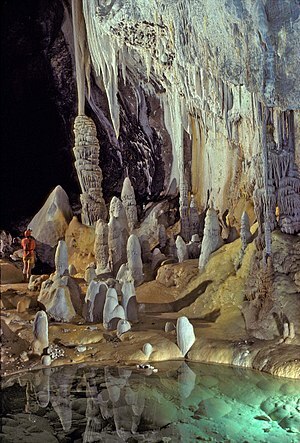 The cavern was a natural limestone cave system. Initially it dropped down alog a hewn staircase and set of minecart rails for a few dozen feet. At the bottom of the stairs there was a rather significant underground lake with a wooden boardwalk across it. There were warning signs posted about not letting anything dangle above the water when crossing the boardwalk. Everlit torches lined the boardwalk as it meanders through the stalactites. The sound of dripping water off the stalagmites seemed to echo through the chamber repeatedly and loudly. The lake itself appeared to be at least 250 feet across, with no discernable current. Presumably there was some sort of monster in the water. Occasional flickerings of light vaguely reminiscent of lightning could be seen in the murky depths of the water, along with shadows indicative of more normal fish. There were crudely carved side passages along the walls of the chamber. The stone there looked quite slick and wet – but passable. Dusty footprints could be seen on the boardwalk, along with signs of a significant force of people having come along one of the passages along the left wall. A few things like knives, coins, food leftovers, a drinking flask, and other items appeared to have been dropped into the lake as a rush went by. Further along that way there appeared to be a significant hollow nook in the wall about a third of the way around the lake from which the tracks along the wall all seemed to emanate. Well, they’d have to go and have a look! Kevin elected to follow the trail – but left a few more thralls to keep an eye on the other routes. He strode boldly off. After all, he was pretty sure that most of the kids would be down here – which meant that their parents wouldn’t want anything too horrible in the way of booby traps left out! The justification for that was kind of vague, but he was in a mood to jump to conclusions today! Raphael tried to avoid stepping anywhere but on the existing footprints or footprints in the dust to insure that he wouldn’t step on a trigger-plate or a mine or something – slow, but sure, in sharp contrast to Kevin’s confident striding along out in front. HE was assuming that he was in an adventure-game based world where traps would suddenly appear as soon as the normal inhabitants were gone or captured – no matter how silly it would be for them to trap their home. Well, the place DID have some built-in silliness, but it wasn’t THAT bad. Marty flew, since he WAS being a bird – although he tried to approach as quietly as possible. He did get vague feelings that there was something lurking beneath the murky water as he silently darted around the various stalactites and stalagmites. It almost seemed as if the discharges of light were reacting to his presence somehow… They seemed to just….. prefer to branch in the direction he was flying. The occasional flashing of point lights also seemed to preferentially occur around him. Raphael was so busy concentrating on where his feet were that he missed the low-hanging stalactite as he walked into it and smacked his head. Drat the child! Was he just well-attuned to the local narratives, or was he actually burning enough power to bend them around himself without even thinking about it? And was there really any way to tell? Raphael declined to speculate beyond his data. Ok… the laser cave fish notion said that Kevin was pulling out of his funk, at least locally. That was something, even if it WAS pretty unhelpful (if not downright silly) otherwise! Marty reached the nook soon enough, followed shortly by Kevin and Raphael. It looked to be a significant living / work area; there were stockpiles of food, drink, various crafting tools, crates, reddish spheres about 18 inches across, and boxes that disturbingly resembled pine box coffins. There were living quarters off to one side and some sort of magical laboratory off to the other. There were also quite a few spells altering the air content, humidity, and temperature. There didn’t seem to be anybody home though. Had they seen the flares in the lake and run? Raphael easily spotted a barracaded doorway in the living quarters. Someone had tried to hide it behind furniture and a few minor illusions. From there, a number of odd muddy footprints led to the workshop area. Marty was actually out of non-regeneration healing for the day, so he was actually being CAREFUL. That last fight had been pretty draining for all of them! Hmm! Not so long ago, he would never have even conceived of the notion of “caution”! The workshop… was an odd place. There were a number of worktables set up and many of them had odd, partially completed, statues laying on them. More spheres of the red stuff were stacked in heaps, and there was a large furnance kiln with that looked to be made to hold them. There were more pine boxes are stacked along the wall with various coded stencils on them. Raphael was busy examining the magical traces… The red stuff looked to have been imbued with energies just waiting to be shaped into enchantments by a skilled craftsman. Four statues of what looked to be craftsmen stood in the corners of the workshop too, hidden behind some of the crates. Marty went to have a look at those! Were they really statues, craftsmen trapped in statues, or just some kind of automata? Kevin thought that this was getting creepy. That much raw orichalcum or philosophers stone or whatever they called it? That would have called for a little energy from a LOT of people – or for stealing lots of energy from a few – which usually resulted in cursed items if they were unwilling. Now, if someone was so fanatically persuasive that they had persuaded everyone to sacrifice their kids to make weapons he was going to be quite unhappy with them! The statues looked to be made of clay, were enchanted with a number of effects, and were in fact alive – or at least something inside of them was. About the time he realized THAT, the statue started moving. Whatever or whoever it was had evidently realized that he knew. Ah! Four craftsmen pretending to be statues!. He used an illusion to illustrate. Kevin – and a few Thralls – were keeping a careful eye out for people trying to sneak out while they were distracted. (Kevin) “Hey, if anyone is interested in the enslavement program, I have a brochure around here somewhere…” (He rummaged briefly). Raphael almost had to laugh. For dark conquerers, Kevin and Marty were VERY easily diverted into conversations! Raphael was is far more interested in the construction of the golems than anything else so far – but he had to admit that the “Is he a dark lord?” was pretty entertaining. Maybe the kid should get himself a certificate of Dark Lordship? Kevin produced and handed him a pamphlet. Raphael saw that… the golems were fairly standard clay golems made to resemble various species. The most unusual thing about them was the large opening in the chest cavity and the lack of a magical program animating it. It looked like the different symbols inscribed into the crates signify what sort of enchantments and species the golem had. Marty was just waiting for their reactions when they finished reading the pamphlet and got to the contract details. It really wasn’t much of a secret any longer! Meanwhile, the Thralls had the door clear and were poking through it. Kevin still wanted to capture the panther kids; they were cute! They knocked first – and a child’s voice announced that “no one is here!” before being hushed. In the interests of expediency, Kevin went for oratory again – explaining that they were in no danger and why they might as well come out. There were one hundred and thirty six youngsters in there – including a number of familiar-looking lizard-like children, and an egg in the mix as well. Ah, lizard-assassins? Then perhaps the ones running the golem-statues were the males! Marty checked with a little “x-ray vision” – and saw a lizard-like creature inside the statue. It was small – about the size of a hobbit – and it is rather firmly embedded in the clay of the statue, which wrapped tightly around it’s limbs and much of the torso. Raphael smiled. So; the kid was probably just good at adapting; otherwise reality might well have reshaped itself to make his early belief – that the statues were remote-operated through the spheres – have been accurate. With that the statue walked over to one of the crates and started reading labels aloud to himself. Meanwhile, the city guard had arrived – and was most unhappy with the news of the scale of the operation found here, the power displayed by the defenders, and the power displayed by the attackers. Major battles just outside their city between numerous high powered and well equipped adventurers was stirring them up into a major fit. Eventually the statue found what it is looking for, pulled out a crate, and opened it up on the floor to reveal a statue of a raccoon-person. The craftman statue then seemed to peel open in the chest cavity to reveal the Saurian. The Saurian climbed out of the craftsman statue and into the one laying in the box. Quickly enough the clay sealed around the saurian and the texture changed to that of hair and clothing. It looked quite alive and “natural”. Ah, they might finally have a link back to Merlin! If he was using creatures that someone else had made that would explain a lot! Hmm. That DID sound like Merlin – or at least another really powerful mage.